I first started reading Carl Hiaasen quite young. He wrote Hoot, which was turned into a movie, and I read that, along with Flush, when I was about 10. A couple years later, I started on his adult novels. My aunt was a collector of books, and a large fan of Hiaasen, so I could peruse and borrow from her library as I pleased. Now, Hiaasen’s books are comfort food for my brain. Lucky You is about Jo Layne Lucks, an African American woman in Florida, who wins the lottery. But she only wins half the lotto, because 2 rednecks win the other half. Since these gents are racist garbage, they decide that anyone who isn’t white doesn’t deserve the lottery winnings, so they go and take it from her. The book mainly focuses on Jo Layne’s work to get her ticket back. There are some fantastic side characters, some accidental murder, and a girl from Hooters. It’s interesting, to say the least. 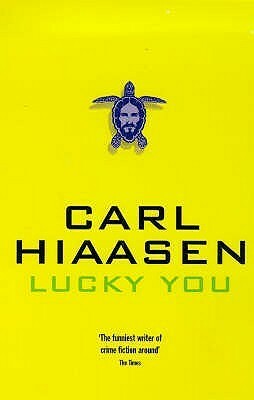 I enjoyed reading Lucky You the way I enjoy all Hiaasen books; I don’t need to reread it, and I won’t say it’s the best book I’ve ever read, but I won’t say it’s bad either. Hiaasen, like most writers, has a bit of a formula to his writing, which can make his books a bit predictable. But, since they’re comforting to me, I have no issue with that. I enjoyed Lucky You, genuinely. I think there was a great amount of personality in each of the characters, and a surprise or two in there. If you’re looking for a beach book, this is the one for you. Please be aware, though, that this is an adult novel and features some adult language and content.